dedicated to consumer financial protection – one of the most, if not the most, controversial of reform ideas floating around – became one of its main elements. The author, Basak Kus, argues that the outcomes in question were driven by the way the institutional policy-making structure related to deep divisions between actors in the financial sector. Download Speri Paper No. 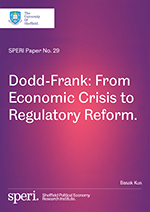 29: Dodd-Frank: From Economic Crisis to Regulatory Reform.